The Super Heroes and Super-Villains of the DC Universe Come To Life! With DC Adventures Heroes & Villains, Volume I and the DC Adventures Hero's Handbook, you and your friends can dive into the DC Universe and fight for truth and justice using legendary super heroes like Aquaman, Batman, Beast Boy, Cyborg, the Flash, Green Arrow, Green Lantern, and many more! DC Adventures Heroes & Villains, Volume I covers characters A-K, from Abra Kadabra and Adam Strange through Kid Flash and Kobra. Each entry comes complete with DC Adventures game information, character details, and a full-colour illustration. Heroes & Villains, Volume I also includes entries on various teams, from the Justice League of America and the Justice Society of America to the Injustice Gang and the Fearsome Five. With Heroes & Villains in-hand, you have a tremendous wealth of material for your DC Adventures games! Powered by the award-winning Mutants & Masterminds game system, DC Adventures Heroes & Villains, Volume I contains everything you need to step into the DC Universe, including hundreds of power examples for the Mutants & Masterminds game rules! Lavishly illustrated by DC Comics artists, this book contains over 280 of the greatest super heroes and super-villains ever assembled! 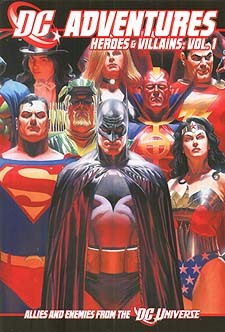 The DC Universe if your to Protect!